Avi cut her hair tonight. Her hair which I was finally able to trim for the first time at the age of three and hasn’t been trimmed again since. Her precious hair which I’ve been dying to turn into a bob because it’s so straight and shiny. I made sure she understood it wouldn’t grow back right away.Â She said okay and snipped.Â Looked at it for a moment.Â And then disappeared in to the bathroom. I knew what was happening in the silence.Â It was just long enough for me to think about what I really should do right now.Â Any other mother would flip her lid.Â But, really, when have I ever made my child wear anything she didn’t want to?Â Child’s been picking out her own clothes since she was old enough to walk….which was early, trust me. 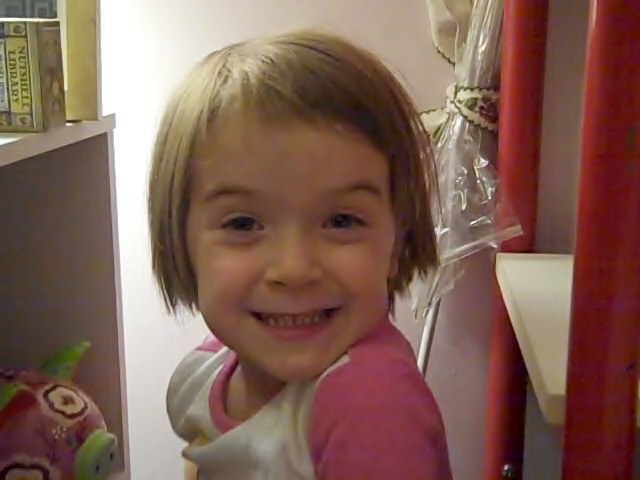 How is hair any different?Â It’s been long not by my choice, but hers.Â So, chopping it off is her choice too. But I want to protect her becauseÂ I imagine the scene in the morning when she looks in the mirror again and realizes she didn’t really want it short after all.Â And she will cry and cry and cry.Â Or will she?Â Maybe she will wake up and love it.Â And what if she does cry?Â Well, now she knows she like her hair long and she can grow it out again.Â It is just hair, after all.Â It does grow.Â What an easy lesson to learn in life…you can make a mistake with your hair and it will grow back. I wish we all got second chances with our choices, even if it’s a year later.Â Maybe we do, come to think of it. Here she is.Â In her new shorn ‘do. Done entirely with kid scissors.Â I only touched the back, I swear.